I bought these adorable hoops the other day at Therapy. Now it first must be stated that since the long ago days of high school, I am not much of one for hoop earrings... unless worn with the right mix, I feel that I look a bit ghetto in them. But these are wire-wrapped, with connecting little beads resembling a bird perched amidst succulent leaves on a swinging vine. I instantly fell head over heels for them! Earrings are admittedly tough for me, I'm so picky about my accessories. 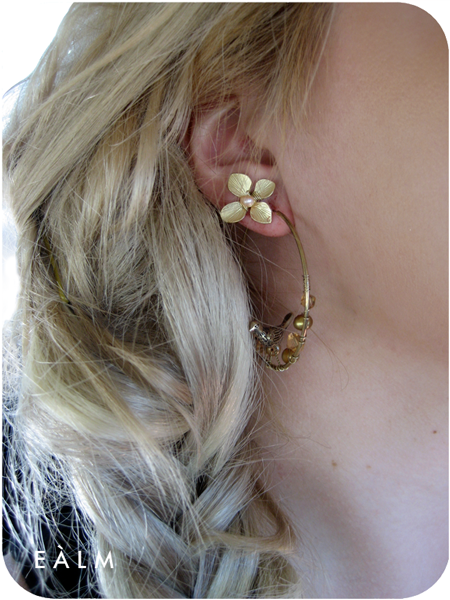 But I'm quite proud of my new finds... and I thought donning a clover earring in each second piercing was a nice touch.